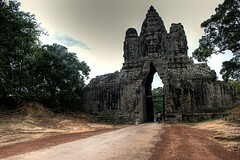 A decision to ban buses from entering Angkor Thom starting from August 1 was abruptly reversed last month. The decision would affect buses carrying more than 12 passengers into the Angkor Thom complex and authorities say that the ban will be postponed after it has concluded talks with the tourism bodies. Having seen the weekend crowds at Angkor, a bus ban might be a good idea!